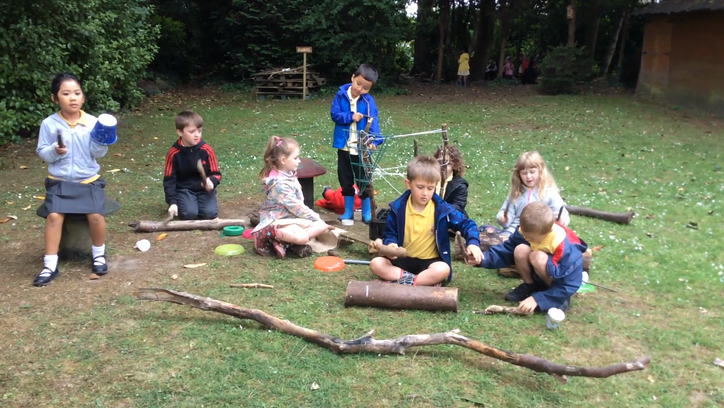 Year 1 have had a fantastic morning in the Forest today! 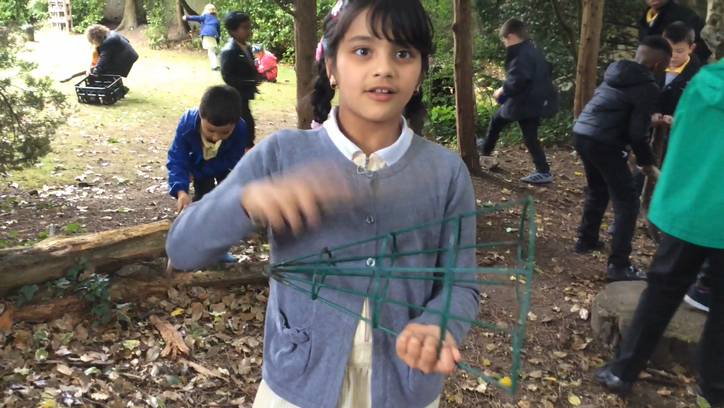 They have been making 'musical instruments' out of natural resources! They even put together a 'samba band' and performed to the school! Here are some video's and pictures of our morning! Year One have started their new context free term - Carnivals! Year One have been busy making pirate hats and writing an Algorithm for each step! Take a look at the fantastic hats that were produced! On Thursday, St Joseph’s has a visit from Clinton Purcell - a gymnast who was selected for team GB! We spent the morning exercising with him and thinking about the importance of keeping fit and healthy! Year 1 have been measuring the capacity of the pirate’s bottles of rum. There were some great predictions and findings taking place in our class today! Look at the amazing boats year 1 have made for homework! Da Iawn pawn! 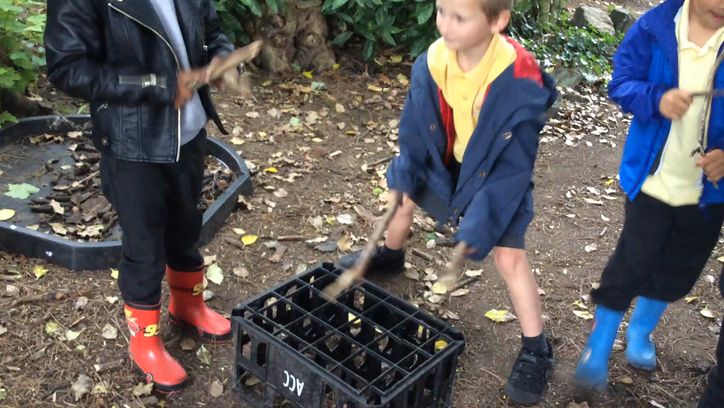 Here are some pictures of our Welly Wednesday outdoor session from this week! Some of the year 1 children have been developing their reasoning skills by sorting the houses into different piles! Lots of the houses looked very similar, so it was a tricky challenge! Year 1 have been investigators this week! As a part of our 'Land Ahoy!' topic, we have been thinking about how boats float? Year 1 decided to chose objects from around our classroom, predict whether they would float or sink, and then they tested their predictions! Some of the items were sneaky and caught them out! We are now going to think about what materials will be best to build a boat that can float! Year 1 absolutely loved having some parent readers join us for a reading session today! Thank you to all the mums, dads and grandparents that came! It was lovely seeing the children engage with different adults in our classroom! We will be doing the same thing next week, on Thursday at 3.05pm. See you there! Year 1 had a visit from John, a volunteer of the RNLI! He talked to us about water safety and keeping safe of the beach! Here are some pictures of our chat! Thank you John! Some Year 1 pupils are using their phonics to help them spell tricky words! Beth sy'n yn yr fasged siopa? Year 1 have been think about what is in their shopping basket! They used Welsh picture dictionaries to find exciting items and to learn some new words! Year 1 had a busy morning on Wednesday pretending to be the 'Traveller' from Stone Soup! They hunted around the forest to find 'ingredients' and even gathered some sticks to build a fire.. Crackle, crackle, crackle. We also has some beautiful art work completed in the sunshine! Year 1 looked at what was around them and sketched what they could see! As a part of our 'Growing Things' Context - Year 1 have been busy designing and making miniature garden's over the Easter half term! Aren't they fantastic? Year 1 have been busy learning about how a tadpole grows and changes into a frog. Here are some pictures of their fantastic work! Year 1 have been very busy making smoothies fit for Superheroes! They used different fruits to make delicious tasting healthy treats! Year 1 have been very busy learning about Pictographs! They were given a mission to find out which superheroes were the most popular in our class, and put this information into a graph! We even made our own Pictographs online. Lots of brilliant child led learning taking place today! Year 1 had a visit from Witchurch Fire Station on Monday! They absolutely loved using the water hose to squirt the cones and felt very important sitting in the truck! Year 1 have been busy finding out the value of each tower, using Numicon to fill in the gaps! Year 1 have been thinking about travelling in different ways this week during PE! On Wednesday, Year 1 went on a material hunt! 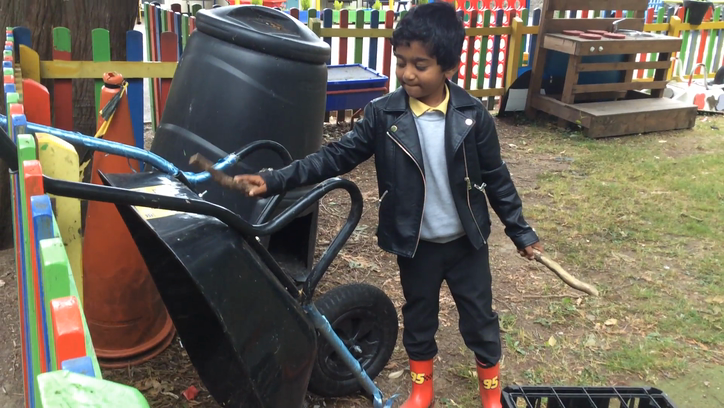 They searched the school grounds to see what they could find! We found: foam, plastic, foil, metal, rubber, wood, fabric..... lots of materials! To finish our 'Family Album' context, Year 1 visited Cardiff Castle to learn all about the Victorian Christmas! The children enjoyed the trip, especially making tree decorations! Here are some pictures from our day. This week Year 1 have been measuring their height using socks! They loved this challenge. We also started to measure the length of objects around the classroom using multi-link cubes as a guide! Welly Wednesday - 4th of December! This week we have been learning about this special time of year - Advent. and creating mini puppets to retell the Christmas Story! We have had another super Welly Wednesday outside! 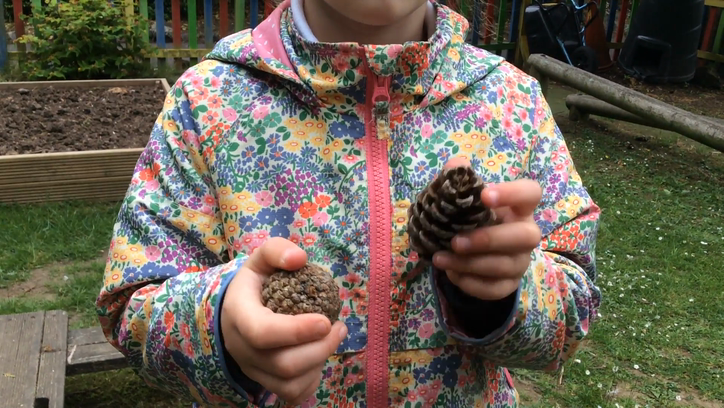 We have been looking for the price tags pinned onto things in our Forest Area! We had to decide what we wanted to buy... the shed, a tree, the bug hotel etc. and find the total amount. There was some fantastic maths in Year 1 today! We have also been painting with mud! We thought about different types of mud, their texture, how they looked and made our 'mud paint'. Take a look at some of our paintings! On Monday Year 1 visited St Joseph's Church to look at the different signs and symbols of a Baptism. What a lovely morning! Year 1 have been learning all about shapes in maths. We went on a hunt to see what different shapes we could see around the school... and there were LOTS! Here are some photo's that the children took in their groups! 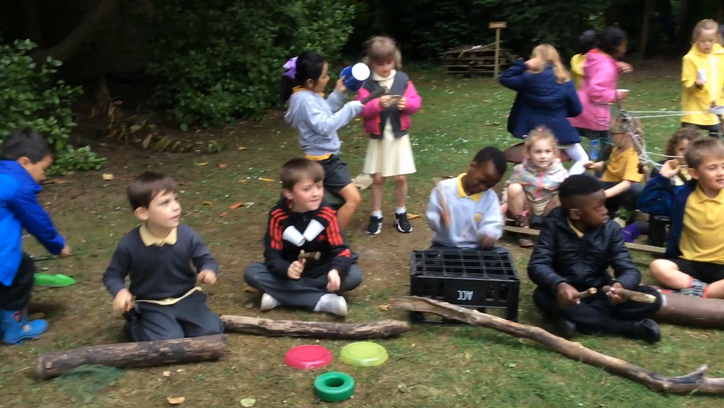 We have had another very exciting Wednesday morning spent in the woods! 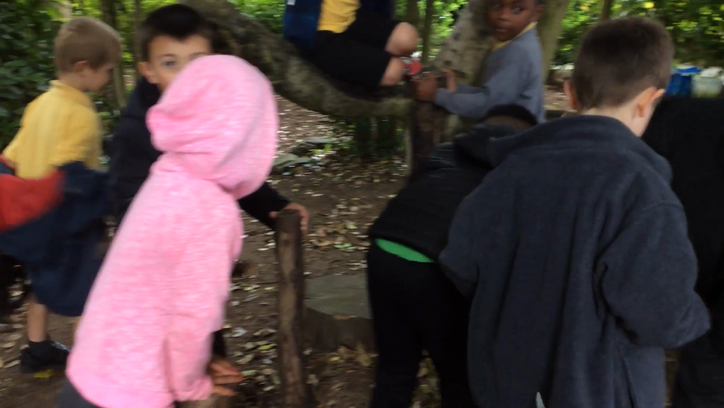 We have been on Scavenger Hunts, creating pictures with the things we found and playing maths games on the yard with the help of our Y6 volenteers! Our favourite part of the day was our snack...... Spaghetti hoops and bread with butter! YUM!! Year 1 have been practicing their mental maths and throwing skills this week! The children aimed their bean bags at the different Halloween pots to see whether they had a Trick (a small number) or a Treat (a big number)! They then used their mental maths to add the numbers together.... we had lots of winners today! St Joseph's had a special visitor on Monday afternoon to kick off our International Week! Here are some photos of us Belly Dancing! We all had so much fun on our first Welly Wednesday this week! We practiced our phonics by finding sounds in the woods..
We even practiced our mental maths on the hop scotch! and last but not least...... We drank Hot Chocolate with Marshmallows as a yummy treat! !